As a first grade teacher I hate being away from my classroom. I have worked hard to build community and to establish routines and every absence feels as though it makes a dent in those, sometimes a significant one. But I’m a mother which means there are times I must miss to stay home with a sick daughter. I’m a wife which means I’ll miss a day soon to be there when my husband receives a teaching award. I’m a professional which means I miss days to attend and present at conferences. If I could just get my twenty little darlings to stay home on those days I would do it! Every year I struggle with how my students behave when I am not there. They are not the class they are with me. To some extent I expect that. But it also frustrates me because I take it as a sign that our classroom community is not strong enough to withstand my absence. It suggests to me that my students are only being so fabulous because I am there. Andrew Campbell has me rethinking this concern. In a post about listening to teachers’ expertise, he writes about what happens in his classroom when he is out. We see it when a class transforms from a pleasant helpful group of students to a horrible, nasty mob simply because a supply teacher arrives. It happens when I merely walk to the back of my classroom so a student teacher can present a lesson. These other teachers aren’t me and aren’t connected with the class the way I am. It had never occurred to me that my students were fabulous with me because of the connections and relationships between us. (Head slap.) Without those, the community is not as strong. This doesn’t happen by magic. I spend many days planting the seeds of these connections, and every day thereafter cultivating and maintaining them. I love the term “classroom culture” because my science nerd brain immediately thinks of the kind of the culture found in a lab to grow cells. It’s a useful metaphor, because like growing cells, the “complex web of connections” is organic and it grows and develops as the school year progresses. And just like a cell culture if it isn’t maintained under the right conditions it dies. I’m not completely sold on this but it’s got me thinking. One of my concerns with Andrew’s thoughts here is that it gives me more power and focus in the classroom than I really want to have. I’d love for my students to have a community that is so strong that someone’s absence, including mine, is not critical. The difficulty there is that my absence isn’t just an absence, it means an unrelated person enters the mix. I wonder what the day would be like if the special education teacher who also teaches in my room was the one with them in my absence. Would the connections and relationships she has with them mean a day much like any other? I’ve got several absences coming up. Andrew’s post has me thinking differently about how to prepare for those absences and how to respond upon my return. Before I leave we usually talk about why I’ll be out and doing our best. Maybe we need to talk specifically about our community and how it will feel to have a stranger in it. Typically I have shared my disappointment with some things when I am back with the kids. I don’t believe this is likely to help our community. Maybe we should talk about why it happened instead. Clearly I’m not settled in my thinking yet. Maybe I won’t ever be. But I’ve got three conferences in the next six weeks so I’ll have some great opportunities to test out some new ideas. Bud Hunt was also thinking about community recently. Clearly it matters. I appreciate all these folks giving me new perspectives and thoughts. 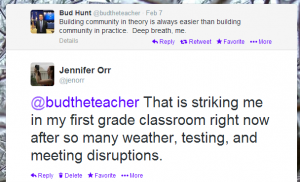 I appreciate your thoughts here about the power of relationships and classroom community. As a pre-service teacher, I have been thinking a lot about these issues, especially in terms of things will go when my mentor teacher is out of the room more and more. As part of the classroom community myself, I can clearly see that the relationships he has with the students play a huge role. I’ve been working on getting to know our students well and building close relationships with everyone in the class. Hopefully when I take over, these relationships will lay the foundation for a positive community. But I do wonder how to help cultivate an environment where behavior doesn’t change drastically when a teacher is absent. It does seem like if everything falls apart when the teacher isn’t there, too much of the community is dependent on the teacher. I wonder if strengthening the relationships students have with one another would help? I’m curious to find out how your students did in your absence.